2014 Toyota Aygo review | What Car? The new Toyota Aygo is the latest small car to join the personalisation revolution. It's set to rival the Hyundai i10 and VW Up, and will also compete with the new Citroen C1 and Peugeot 108, with which the Toyota shares its platform. Final UK pricing and equipment is yet to be confirmed, but there are likely to be three trims, including a base Aygo, mid-spec X-Play and the range-topping X-Wave, which comes with a scrolling, full-length canvas roof as standard. Buyers can choose from a broad variety of contrasting coloured trim for the exterior and interior. The standard running gear is a 68bhp, 1.0-litre, three-cylinder petrol engine complete with a five-speed manual gearbox, but a five-speed automatic 'box is also available. There’s an Eco model that gets a stop-start system, reducing emissions from 95g/km to 88g/km. 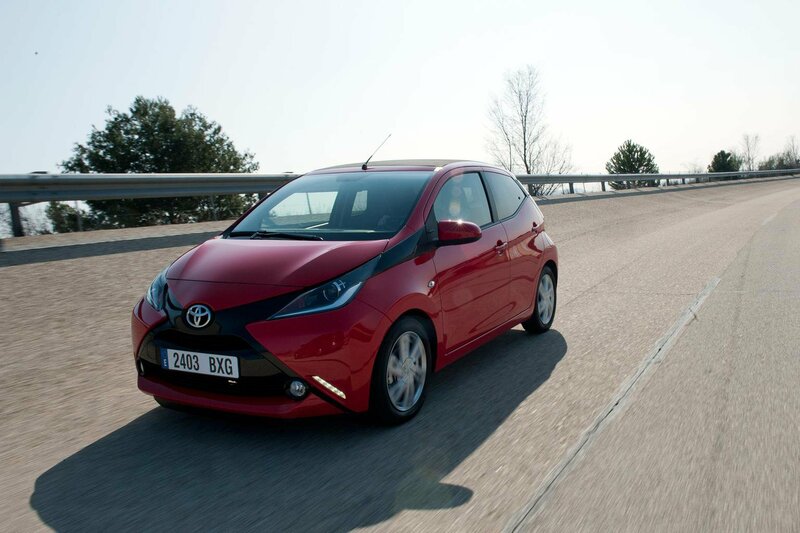 What’s the 2014 Toyota Aygo like to drive? At low speeds, the Aygo is quite fun, and well-suited to the bedlam of busy urban driving. A tight turning circle, predictable steering response, and light clutch and gearshift make it easy to potter around in, while engine and road noise are kept to a reasonable background hum when the car’s at a sedate cruise. However, drive it a little harder and the thrummy engine makes a proper racket. Some might find the tinny burble entertaining and encouraging, but most will find it quite wearing. You’ll be hearing it a lot, too, because the engine needs to be revved to well over 3000rpm before it really picks up. There’s also a lot of wind noise at higher speeds – especially in the canvas-roofed car. Still, the Aygo's engine will pull from low revs, albeit slowly, so you don’t have to change gear too regularly around town. If you don’t have to have an auto gearbox, you’re definitely better off with the manual. Not only will it cost you less to buy, but the auto is quite lazy when changing up, so it can interrupt the car’s forward momentum enough to have you nodding forward and backwards during changes. The Aygo handles well enough, though. It grips well and feel comfortable enough through fast corners, although there is noticeable body lean and the steering feels quite sterile. We haven’t yet driven the Aygo on the road, but our stint in the pre-production cars suggested that (on standard 15-inch wheels) it soaks up small ruts and creases in the road surface well, keeping it settled most of the time. As with most short, lightweight cars, it can be a bit choppy over bigger bumps and undulations – particularly at higher speeds. What’s the 2014 Toyota Aygo like inside? Even by city class standards, the Aygo feels a bit cheap inside. There’s lots of exposed metal, some of the switch movements feel quite clunky, and there are plenty of sharp-edged plastics. The cost-cutting is just as evident in the back, where the windows are hinged, meaning you can only push them open a few inches rather than wind them down. Having said that, a smattering of gloss plastics perk things up, and there’s loads of potential to make the Aygo's cabin feel classier by adding body-coloured inserts, a multi-function steering wheel, a 7.0-inch colour touch-screen and climate control (which replaces the more low-grade heater controls with a digital readout and gloss buttons). That optional 'X-Touch' screen will be a popular addition, because it allows for full integration of your Android or iPhone including key online apps, and also includes a rear-view camera. Otherwise, the Aygo's driving position is comfortable enough, but you sit quite high and the steering wheel adjusts up and down only – not in and out – so taller drivers may struggle to find a comfortable driving position. If rear passenger space is a priority then there are more suitable city cars. Even average-sized adults will have their knees pressed into the back of the front seat, and the tapering windowline also makes the rear seats feel a touch claustrophobic. A Hyundai i10 or VW Up will certainly be better for those needing to carry four on a regular basis. The boot is much bigger than it was in the old Aygo, though – up 29 litres to 168 litres with the seats in place. However, it’s a big drop from the load lip to the narrow boot floor, and the seats leave a step up in the load bay when folded. Equipment levels haven’t yet been confirmed for the UK, but expect a USB socket and air-conditioning to be standard on every model. The Aygo gets six airbags as standard, but it hasn’t yet been tested by Euro NCAP. The Aygo brings a distinctive style and low emissions to the supermini class, but there are rivals out there that are quieter and more spacious. We’ll have to wait until prices are confirmed, and we’ve driven the car in the UK in final production form before we can give a definitive verdict, but on this evidence it seems that the Aygo is competitive in most key areas, and lots of fun, but still a way behind the class leaders.